This Keto Zucchini Recipe is fresh Zucchini Lasagna made with fresh garden vegetables and creamy ricotta cheese. 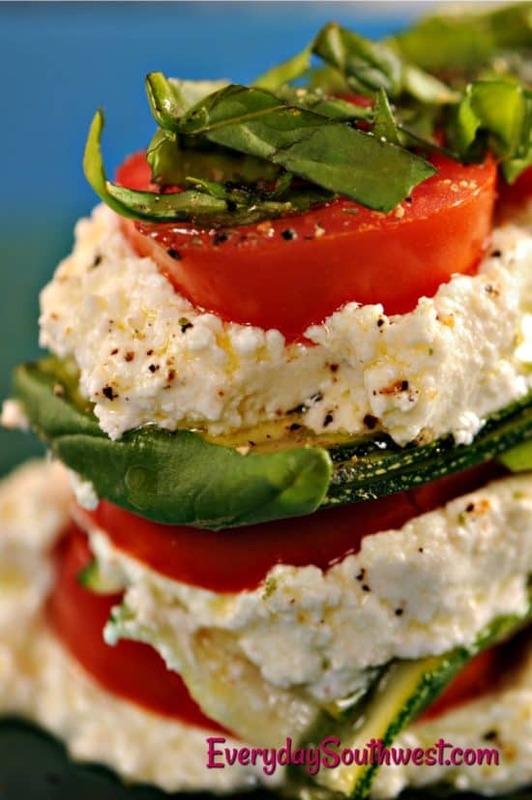 It is a perfect salad or vegetarian main dish, make the zucchini stacks a little smaller for a healthy appetizer. I just love interesting and new recipes for zucchini! Let’s face it, zucchini does need make over once in a while… don’t we all. You will love this fresh and healthy spin on vegetable lasagna. It is a great keto recipe for dinner or a side salad. Keto zucchini recipes are very popular right now but, this recipe has been a fan and family favorite for years. This zucchini lasagna recipe was first posted by Donna Kelly in September of 2010 and it is still a seasonal vegetable favorite! Donna’s original recipe calls for homemade ricotta cheese (I put her tips at the end of this post) but, it is delicious with store bought ricotta as well. I have been updating many of our favorite recipes from our early years as bloggers and reposting them to make the recipes easy to find (with good keywords) and easy to print out with an easy, printable recipe plug in to make our recipes easy to keep at your finger tips. This Keto zucchini recipe is just as popular today as it was in 2010. Here is Donna’s original post. She also posted it on her blog ApronStringsBlog.com where she blogs with her daughter, Anne. Head over and checkout some of her other healthy recipes. Remove from milk mixture from heat and stir in 1/4 cup of lemon juice. For a thicker ricotta (great for baking), gather the edges of the cheesecloth together and tie into a bundle. Hang the bundle over the bowl and drain for another hour. Turn ricotta out of the cheesecloth into a bowl or container. Serve ricotta right away or refrigerate up to 5 to 6 days. 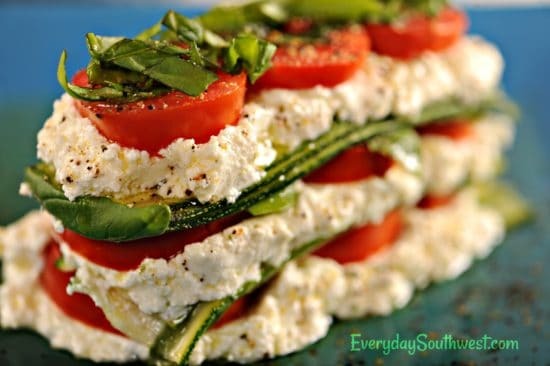 Thinly sliced zucchini stacked with ricotta and fresh tomatoes makes a gorgeous, fresh vegetable lasagna. This delicious zucchini recipe is naturally keto friendly and the perfect salad or vegetarian main course. Shave zucchini into long, thin slices then, brush lightly with olive oil. Sprinkle with salt and pepper. Stack three slices on the center of each small plate. Cut zucchini in half cross-wise if slices are too long. Top zucchini with layer of ricotta cheese, drizzle with olive oil. Add a layer of tomato slices. Season with salt and pepper and top with chopped basil. Repeat the layers until the Zucchini Stacks are the desired height. 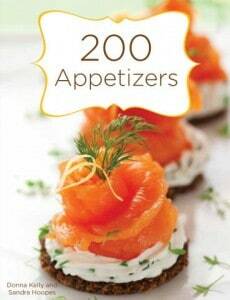 This looks like such a fun appetizer! Thanks for the great tips on making ricotta, too! Thinly sliced zucchini is a great alternative to traditional lasagna noodles. Can’t wait to try making homemade ricotta!